Judy and Harvey wrote in January 2015, they ask 'can you throw any light on the two photographs'. 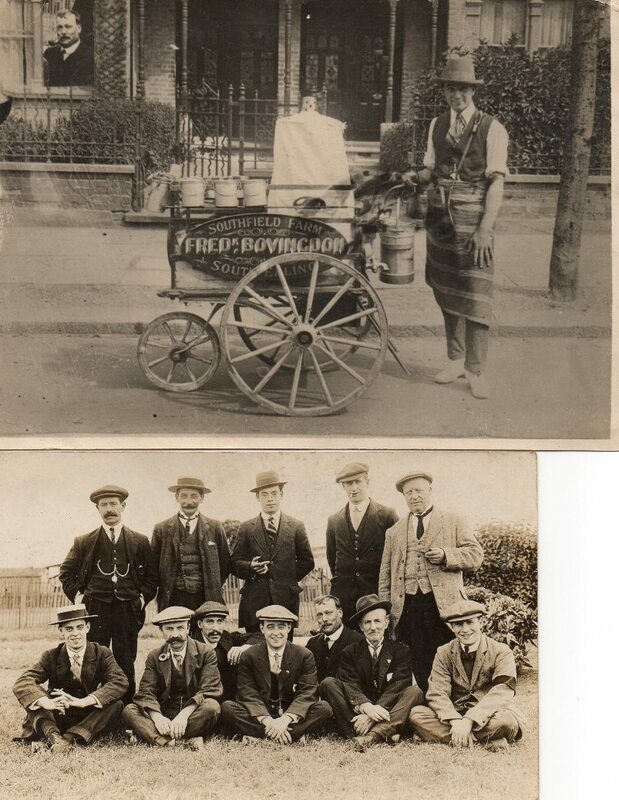 Frederick Bovingdon, the son of James and possibly the milk cart man, was born 16 Nov 1878 in Brentford and died 17 Mar 1928 in Lower Heyford, Oxfordshire, where up until his death he had been Licensee of The Bell Public House. He was listed in the census of 1901 and 1911 as living at 325 High Street Brentford with his occupation in 1901 as being that of “Butcher working from home” but this had changed to ”Lately Meat Carrier” by 1911. Nothing so far therefore to confirm the milk/dairy connection or identify him as the barrow boy but that may be something that happened after he married Florence Jane Meakes on the 10th Feb 1915. Thanks to assistance from the Ealing Fields Residents Association possible locations for the first photo in South Ealing have been suggested: Temple Road; between 22 Little Ealing Lane and Weymouth Avenue on the north side. This is puzzling as the Bovingdons are thought to have lived at the High Street address, and later at Whitestile Road. Does anyone recognise any individuals in the group photo, and what bound them together? If you can help please get in touch, I will forward any replies. Also does anyone know the circumstances under which the first photo might be doctored to include the gentleman?